An Immortal's Guide to Tarth. An Immortal's Guide to Tarth is a tongue-in-cheek look at what relocating to the Tarthian Empire would be like for the immortals in books by Kayelle Allen. 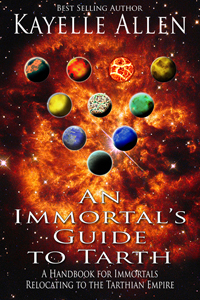 A bit of fiction, written in a non-fiction way, the book offers guidance from Joss Avaton, one of the immortals. Provides dire warnings about who not to cross, and what to do about pesky Mundanes (namely, those annoying humans), and who among the Chosen is not to be trusted. The role playing game of Peril is spelled out, with downloads for character sheets and rules. Includes a who's who among the immortals, and stats of the players, with never before revealed secrets about Luc Saint-Cyr, Pietas, and others. A must have for fans of the series. This handy guide will inform, entertain, and provide peeks behind the curtain. 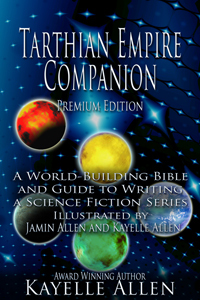 Title Tarthian Empire Companion, an illustrated World-Building Bible and Guide to Writing a Science Fiction Series. Original art by Jamin Allen and Kayelle Allen. For the science fiction writer, this volume teaches you how to build believable worlds, track details of your story, organize your writing, and lay out your story bible. Novice or experienced, you will pick up tricks and tips here. Includes organizational tips, links to marketing sites, groups supporting writers, science fiction groups and more. For the science fiction fan, the Companion reveals the worldbuilding magic that makes Kayelle Allen's Tarthian Empire tick. She shares every character in every book, 10k years of future history, offers inside peeks at scenes and stories, lays out a quick tour of the Empire, and dishes up a surfeit of secrets, all in one illustrated volume. Original art by Jamin Allen and Kayelle Allen. The illustrator for the Tarthian Empire Companion is Jamin Allen, the founder of Nimajination Studios, who is known as "Volgraza" on the popular YouTube channel V^2Gamers. He is married and has two sons. His professional training as an illustrator began at the Art Institute of Atlanta, but he knew he wanted to be an artist from the time he was five. His latest project is designing a game for a web series he is creating.